Every change to a a node will cause an increase to one of the version numbers of that node. The three version numbers are version (number of changes to the data of a znode), cversion (number of changes to the children of a znode), and aversion (number of changes to the ACL of a znode). Added in 3.2.0 -- SessionMovedException. There is an internal exception that is generally not seen by clients called the SessionMovedException. 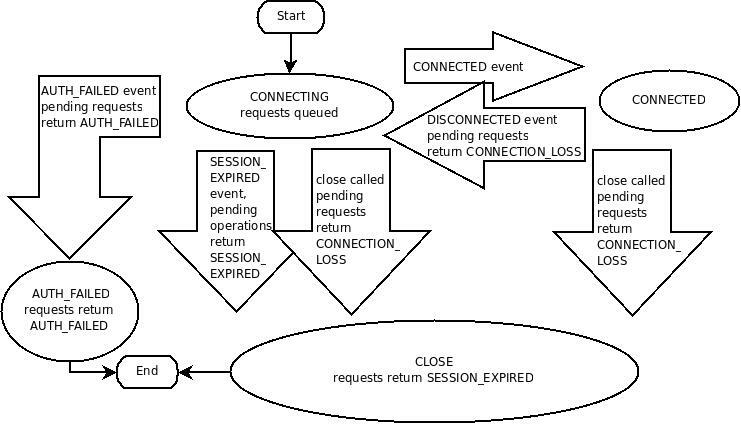 This exception occurs because a request was received on a connection for a session which has be reestablished on a different server. The normal cause of this error is a client that sends a request to a server, but the network packet gets delayed, so the client times out and connects to a new server. When the delayed packet arrives at the first server, the old server detects that the session has moved, and closes the client connection. Clients normally do not see this error since they do not read from those old connections. (Old connections are usually closed.) One situation in which this condition can be seen is when two clients try to reestablish the same connection using a saved session id and password. One of the clients will reestablish the connection and the second client will be disconnected (causing the pair to attempt to re-establish it's connection/session indefinitely). Watches are maintained locally at the ZooKeeper server to which the client is connected. This allows watches to be light weight to set, maintain, and dispatch. When a client connects to a new server, the watch will be triggered for any session events. Watches will not be received while disconnected from a server. When a client reconnects, any previously registered watches will be reregistered and triggered if needed. In general this all occurs transparently. There is one case where a watch may be missed: a watch for the existance of a znode not yet created will be missed if the znode is created and deleted while disconnected. The clients view of the system is guaranteed to be up-to-date within a certain time bound. (On the order of tens of seconds.) Either system changes will be seen by a client within this bound, or the client will detect a service outage. You should see a list of node who are children of the root node "/". If you are using watches, you must look for the connected watch event. When a ZooKeeper client disconnects from a server, you will not receive notification of changes until reconnected. If you are watching for a znode to come into existance, you will miss the event if the znode is created and deleted while you are disconnected.